Top 5 Reasons to Learn How to Needlepoint NOW! Do you want to learn how to needlepoint, but are afraid that it is too hard? Or, maybe your grandmother was a stitcher who made items with one basic technique that took forever to complete a project? To kindle your enthusiasm for this compelling craft, here are the top 5 reasons you should learn how to needlepoint NOW, as well as 5 free needlepoint designs (one for each reason) to help make your excitement complete! Needlepoint is Loads of Fun! There are unlimited possibilities for working designs in needlepoint. From simple tree ornaments to fancy Oriental rugs, you can stitch anything your heart desires. Take this free “Funny Side-Up” needlepoint design, for example. Once you’ve finished stitching, the completed needlework can be made into a trinket bag, box top cover, cosmetic bag, door sign—you name it. You can have loads of fun being as creative as you'd like with decorative needlepoint stitches and novelty threads while stitching the 7-inch by 3-inch design directly onto a sweater, jacket or pair of jeans with waste canvas. Use colorful strands of leftover threads and fibers you currently have in your stash to work the quirky letters. Add beads and other embellishments like sequins and found objects to make the funny sign unique. Needlepoint is Easy & Fuss-Free! Before picking up needle and canvas, many beginners have the notion that needlepoint is an outdated fussy craft or hobby with long drawn-out and old-fashioned projects that are fit only for home decorating items like pillows and wall hangings. Actually, this is not at all the case. Needlepoint has emerged into a compelling no-fuss art form where creative efforts can be turned into many more varied and useful items other than those for the home including clothing, cases for laptops, tablets and smartphones, electronic devices and more based on the needle artist's own creativity and ingenuity. The basic materials and supplies for needlepoint are simple--just a piece of canvas, thread, and a tapestry needle are all that's needed to get started. 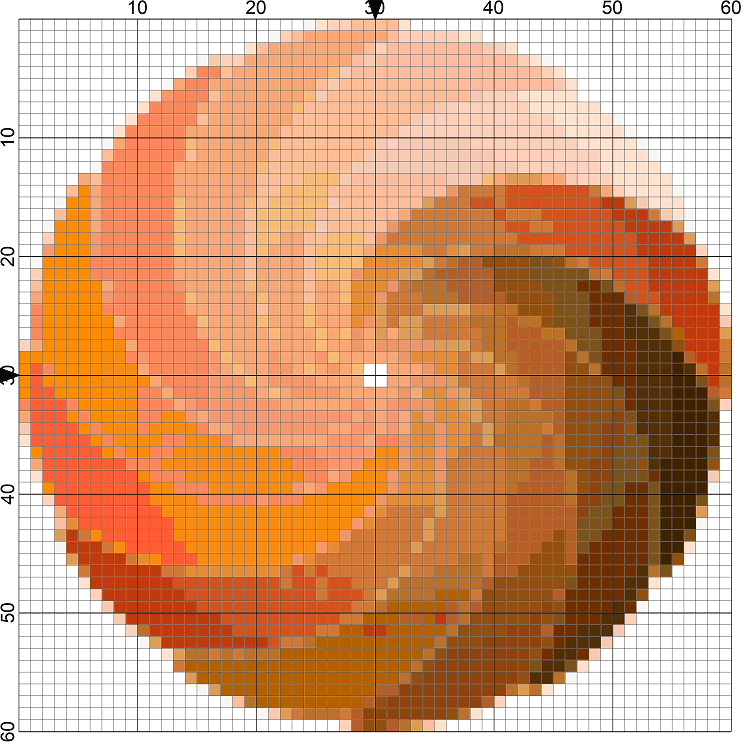 See just how easy it is to stitch a set of beverage coasters or an external portable hard drive cover with this 4.29-inch square free Starburst Swirl Needlepoint Chart, a piece of 8-inch square #13-mesh mono canvas and #20 Tapestry Needle. The simple project uses basic tent stitches that make it ideal for a beginner. More decorative techniques like the Encroaching Gobelin Stitch can be worked by experienced stitchers as well. Four or more monochromatic shades of orange to brown colored thread would work well for the swirls in this design--making it truly fuss-free! After a stressful day at home or work, you can relax with a cup of your favorite beverage and a simple needlepoint project to place a few new stitches before dinner or bedtime. The soothing rhythm established by a smooth and consistent stitching tension will relax your heart and mind and reduce the stress from tired muscles and an anxious mind. To improve your mood, make yourself as comfortable as possible in a position that supports your back and neck as you stitch. Consider working the free ​Gentle Window Panes Needlepoint Pattern with super quick Bargello or Long Stitches in soft calming colors. These stitches are worked vertically or horizontally over two or more canvas threads in a staggered fashion to form simple or intricate needlepoint patterns. When using the Long Stitch, select a thicker thread so that you have adequate cover on both the front and back of the canvas. The 7-inch square needlepoint design can be worked as a stand-alone project and then finished into a small purse or another fashion accessory; or, the pattern can be repeated multiple times in different color sequences, and then joined together to form a rug, table runner, fancy vest or even a jacket or full-length coat! Needlepoint is one of the most addictive crafts you can learn. Within a few weeks or months of consistent stitching, a beginner can advance to an experienced needlepointer in no time at all! You are guaranteed to get hooked after completing your first needlepoint project, which will have you stitching your way through larger and more complicated projects until you're designing and painting your own pieces similar to this Argyle Plaid Needlepoint Pattern. Work the 3.5-inch square needlepoint project entirely in tent stitch to perfect this basic needlepoint skill, or use the charted argyle pattern for inspiration as you create a personal plaid design of your own. Although it sounds a bit daunting, making your own needlepoint plaid is very easy with a set of numbers such as a birthday, wedding anniversary, or another special occasion. Each number represents the number of rows you will work in a specific color. Once you've got the sequence, you'll stitch it in two directions repeatedly across the needlepoint canvas. It is easy to make lifelong friends when learning how to needlepoint. From your local shop owner to a group of needlepoint guild associates, you're bound to find fellow enthusiasts who started out just like you did as needlepoint "newbies". Needlepoint friends can give you helpful tips and advice on how to work stitches and correct mistakes, shortcuts to finishing a project, as well as ideas and encouragement for making your own needlepoint creations. With friends, you can share the highs and lows experienced while tackling a larger or more complicated needlepoint project. Want to know how to make a few more needlepoint friends? Join a local chapter of the American Needlepoint Guild or the Embroiderers Guild of America. Get started with this Penguin Needlepoint Friends Design initially on your own; and then invite a few friends to work on it with you during a weekly "stitch-a-long" or for a challenging group cyber project.